It took 13 words to turn the mixed martial arts world upside-down. And one of them isn’t even really a word. Since then, it’s been an absolute tornado of supposition, rumors and reactions. Did McGregor really retire? Is he simply saying he will retire while he’s still young? He’s still only 27, with plenty of “young” years left, after all. But if he means he’s retiring now, why in the prime of his career, with a massive rematch scheduled to headline UFC 200? Again, we don’t know much in this strange, strange situation. But here’s what we’ve managed to scrape together. That’s supposedly the only direct follow-up we’ve gotten from McGregor. Not that it will matter much if McGregor has in fact retired effective immediately, but UFC President Dana White has removed him from the UFC 200 main event. This was scheduled to be the biggest pay-per-view event in the company’s history, before the now infamous tweet. White said that McGregor had failed to meet media obligations, which required McGregor to be in Las Vegas to promote the upcoming event. McGregor apparently did not want to interrupt his training in Iceland, so he missed the Las Vegas gig, and that is what prompted McGregor being stricken from the card. So perhaps this retirement is retaliation for the company’s inflexibility in the pre-fight promotion requirements. But many people aren’t buying the idea that White would cut the biggest fight of the year–and probably the history of the UFC–simply because McGregor missed a promotional event. 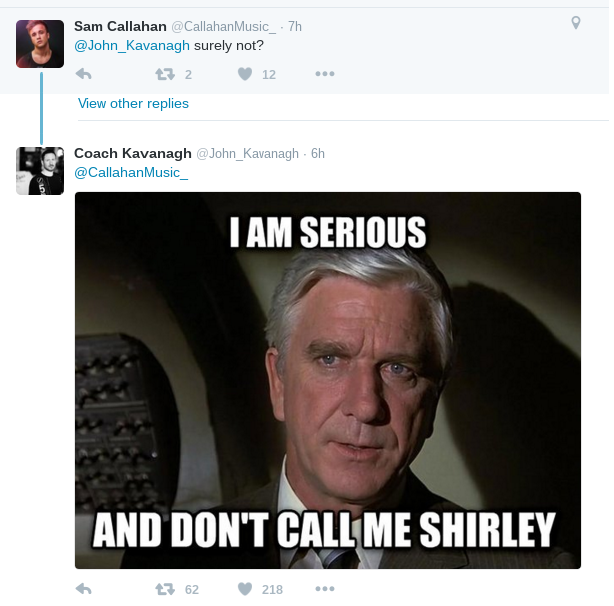 And when one follower suggested that he was “surely” not serious, Kavanagh doubled down — while channelling his inner Leslie Nielsen. At least he’s keeping a sense of humor about things. On April 11, Portuguese fighter Joao Carvalho tragically passed away from injuries sustained in an MMA fight just days earlier. The fight took place at the National Stadium in Dublin. McGregor was in attendance supporting his friend Charlie Ward, who was Carvalho’s opponent. “To see a young man doing what he loves, competing for a chance at a better life, and then to have it taken away is truly heartbreaking,” McGregor wrote. If the retirement is real, it seems a lot of people believe this is the true reason behind it. Perhaps White is using the missed promotional engagement in order to evade a nightmare PR situation where he would have to explain that a death in the sport lead to its biggest star retiring. It just gets crazier and crazier. I guess my work here is done I’m retiring too✌?️?? Now, this is probably nothing more than a tongue-in-cheek response, and as of press time there hasn’t been any news of Diaz being pulled from UFC 200, but he also hasn’t followed up with a reassuring “jk lol”. So for now it’s all up for speculation. But Diaz, whether sincere or not, certainly did his part to stir a pot that was already raring to spill over. And that’s pretty much what we know — or for that matter, think we know. We’ll be the first to admit that we’d love nothing more than to find out the Irish celebrate their April Fool’s Day on the 19th. We’re big fans of McGregor. He’s been a catalyst in propelling the popularity of mixed martial arts over the last few years. And in doing so, he has brought a lot of positive attention to calisthenics and bodyweight training. A lot of that has to do with the training he’s done with the world’s foremost movement master, Ido Portal. However this whole thing shakes out, there is one more thing we now know: McGregor, without even having to set foot inside the octagon, has the ability to captivate the entire world of mixed martial arts like no one else.